Australian Rules Football Frequently Asked Questions. What you want to know about Aussie Rules football. Last Fully Updated: August, 2015 with minor updates prior to 2016 and 2017 seasons including AFL Women's awards. New full update underway for V2.5 (Nov. 2018). v2.5 update by entire staff underway for changes in 2018 and 2019. Dedicated to AFANA Charter member, Dana Spuhler, who created our first version. FAQ Sections listed below - click to go directly to a topical section or use the arrows to navigate. Please use the contact form to send us suggestions or corrections. 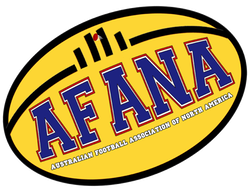 Footy FAQ: What is the Australian Football League?